The world’s leading personal care ingredients event will return to Paris for its 30th edition in April, with in-cosmetics Global once again providing a platform for R&D teams to source the most innovative ingredients and learn about the trends shaping the future of the beauty industry. 20 February the workshop “How to create and preserve an aroma, brightness and sensation of the product?” was held in the Leko Style Moscow office. The program of the seminar includes several interesting products’ presentations of BASF, Leko Style, Dullberg Concentra and two master classes from Leko Style technologists. Research and Practice Seminar, that was held at the Moscow plant SVOBODA, was devoted to the Russian market of solid soap issues and met together developers, producers, equipment suppliers, sellers of such important hygienic product as well as market analysts and editors of leading specialized publications. BeautyStreams has published the 5 trends in cosmetics industry. Delivery systems carry active compounds to the site of their action and used in cosmetics mainly for their ability to improve the stability of sensitive actives, their better incorporation into formulations, reduction of irritation potential, excellent penetration and sustained release properties. The most commonly used delivery systems include liposomes, niosomes, microemulsions and nanoemulsions, micro and nanoparticles, polymeric micelles and cyclodextrin complexes. Their properties and effects are different and each system is suitable for different types of compounds. Delivery systems are widely used for the incorporation of anti-aging compounds, such as whitening agents, plant extracts, antioxidants and vitamins, as well as for UV filters and fragrances. To overcome the low penetration rate of active ingredients into the skin vesicular carrier systems have gained a wide attention especially in the field of nanotechnology like e.g. liposomes, ethosomes or lipid nanoparticles. Also nanoemulsions are considered to be promising candidates for dermal drug delivery with the advantage of low skin irritation, high drug loading capacity and drug penetration enhancement. Among them new stable anionic nanoemulsions based on the membrane-forming, an eatable and skin friendly emulsifier derived from sunflower, became superior over other vesicular carriers. Depending on the usage of additional emollients/oils and stabilizers two different emulsions can be obtained: a multiple water-in-oil-in-water nanoemulsion (Hydro-Tops) or an oil-in-water nanoemulsion (Lipo-Tops). Under extensive investigation, it was proven that both nanoemulsions exhibit a significant better performance in encapsulation efficiency and penetration efficacy and therefore provide a higher bioavailability of active ingredients in skin – compared to flexible liposomes, niosomes and solid lipid nanoparticles. The article is devoted to the global natural and organic cosmetics market. 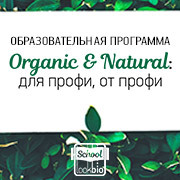 There is presented an evaluation of dynamics of the segment and the development forecast there and identified sales and consumption of organic cosmetics top countries, global headwinds of the growth of the organic cosmetics market in Russia. 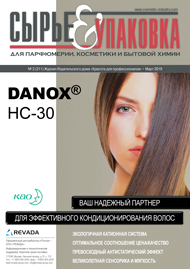 The article studies the statistical data, published in 2018 – 2019, on the basis of which the current situation on the Russian soap market is detected. The studies carried out in Chemical&Biological Association at Russian Academy of Sciences ”Firm Vita” showed that the biological activity of bioantioxidant complex, derived from young, fast-growing undifferentiated (callus) ginseng cells, significantly higher than the wild ginseng root extract. Smell is a part of the human life. With malodors so prevalent, there are many odor neutralizers on the market today. In fact, almost every chemical company in the world offers odor-eliminating products, and even though they all serve to counteract or counterbalance odor, they are all different and some work better than others. Here we examine some of them and analyze way of their action. This year, Dzintars – one of the oldest cosmetic enterprises in the post-Soviet space, celebrates the 170th anniversary. The history of the factory is unique. This is something that can really be proud of – dedication, people, who creates legendary products, exclusivity and scale. The International scientific ExpertForum which includes the 2nd International scientific expert forum Resources for Growth. Chemistry for Life: State and Business, the 2nd International exhibition of household chemistry and personal care products ChemiCos-2019 and the annual award in the sphere of consumer chemicals and cosmetics ChemiCos Unique took place at the end of February in Crocus Expo IEC. During the year, the world hosts many competitions and awards, both national and international, dedicated to packaging. They consider the packaging unit from different angles, from the use of materials and production methods, to the final decoration and presentation in retail chains. Bakic Group won several awards at prestigious international competitions in 2018.